First a bit of history--This airplane is a Champion Citabria model 7ECA. It was built in 1968, but was only flown for a few years before it was severely damaged by high winds. Thus, it is presently approaching 30 years in age but has accumulated fewer than 500 flight hours. The damage occurred during a storm while the airplane was tied down outside. The four wooden spars of the wings were snapped by the force of the wind and steel tubing in the forward fuselage was crushed as the aircraft landed on its back. In Early 1990 Aero Squadron 117 Inc. acquired the partially completed project. At this point most of the structural damage had been repaired. Any aircraft project is expensive by definition. Accordingly, progress on the plane has been slowed by the need to raise funds for parts and supplies at each stage of the restoration. Nevertheless N1873G is closer to being airworthy than it was seven years ago. 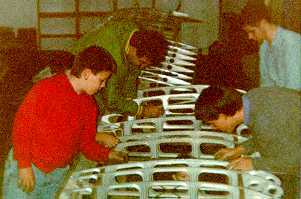 1990--Much of the first year of the project was spent setting goals, sorting existing parts, and determining what would be needed to complete the plane. Many hours were spent cleaning parts after years of storage. 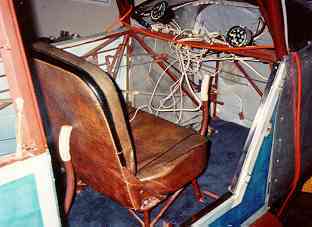 1991--With the guidance of a local upholstery shop Explorer members and their advisors refinished the seats and interior panels with blue naugahyde and matching carpet. This replaced the factory brown interior which was showing its age and was generally ugly. The layout of the instrument panel was determined and a new panel was fabricated. 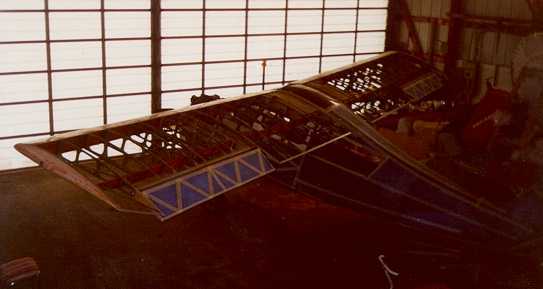 1992--Wiring for navigation and strobe lighting was installed in the wings and the metal leading edge sheeting was installed over the ribs. 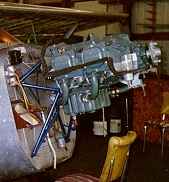 1994--The Lycoming 0-235 engine was installed. 1996--A new windshield was installed along with the fuselage fuel lines. 1997--The new year has begun with a more aggressive work schedule and new goals. Sunday afternoon work-parties have yielded good work and good food. The plumbing and testing of the wing mounted fuel tanks marked the end of structural repairs to the wings. Current work is focused on the application of the ceconite fabric covering to the right wing. Photos of this work are coming soon! What's needed--Throughout the project, its progress has depended upon the ability to replace or overhaul parts as necessary. Fund raising projects and donations have made possible the purchase of upholstery materials, a windshield, fuel system parts, engineering drawings, assorted hardware, and various tools and supplies. As the project continues, fund raising will become increasingly important. The most expensive purchases lie ahead. As is, the plane lacks some important and expensive parts. Missing components include the propeller, and several flight instruments (turn and bank indicator and compass) Some other parts are yet to be replaced due to damage or age. These include wing struts, tail brace wires, starter, wheel brake assemblies, and tires to name a few. While Aero Squadron 117 strives to be self-supporting in this project, corporate and private donations have helped and are always welcome and greatly appreciated.